Gordon & Grant continues to provide Santa Barbara and surrounding areas with hot tubs and spas that allow those who spend time in them the chance to carry on the hot water tradition they started in the 70's. While Redwood hot tubs are continually built onsite in the Gordon and Grant downtown location and remain a popular option, vertical grain cedar has been added as a more affordable and readily available option for customers who still enjoy the traditional wood spa. These hot tubs can be shipped anywhere in the world, and come with assembly instructions. In addition to building and maintaining wooden hot tubs for customers, Gordon & Grant also sells and provides services for various brands of acrylic portable spas, including Jacuzzi, Sundance, Marquis, Artesian Garden Spas and TidalFit swim spas. Website : <a rel="nofollow" target="_blank" href="http://medicalsaunas.com/">http://medicalsaunas.com/</a> The first-ever sauna designed to improve blood flow, heal your muscles, and achieve absolute pain relief for a better night's sleep. When we began the long process to create a truly medical sauna that can help you heal, we learned there are two critical factors necessary to make a perfect medical sauna. The most important factor was that our saunas needed to produce and sustain proper heat temperatures to penetrate the skin because that is the cornerstone of sauna therapy. You’d be surprised how many saunas fail to meet this basic requirement—something we learned through our testing of several leading sauna brands. Many saunas don’t provide enough heat, can’t sustain ideal temperatures, or do not evenly disperse heat through the sauna, resulting in an uneven distribution of benefits. The other important factor in making a perfect sauna is durability. If your sauna can’t manage daily use and requires extensive maintenance then it is not worth your time and money. We worked around the clock with sauna manufacturers and doctors to create and develop the ultimate line of saunas. Together, we engineered a sauna that dramatically helps you relieve pain, improve cardiovascular health, strengthen your immune system, and lose weight. With so many benefits unmatched by other saunas, we decided to call our finished creation the Medical Sauna™. Our services include consultation, sauna design, installation, sauna woodwork refinishing, and rejuvenation; including manufacturer warranty work. Each service is essential to ensure a long, healthy life for your sauna as well as insuring user safety. We provide a full service design team to select the appropriate site, sauna design, and selection of wood type, needed supplies, outfitting, sauna installation and regular maintenance. Our staff is highly knowledgeable, experienced and are happy to pass this knowledge on so you can enjoy a perfect sauna. Not only have we at Nordic Sauna built sauna baths for over 55 years, we also offer all the accessories you’ll need. We have everything from sauna controllers and sauna thermometer styles to sauna clocks and the right sauna heater for your commercial or home sauna. Whether you’re comparing equipment for commercial sauna rooms or you’re shopping for a quality home sauna, we have the sauna equipment and steam shower equipment you’ll need for the perfect sauna bath experience. OUR EXPERIENCE Our many years of installing saunas allows us to understand your needs when putting together contractor kits/material packages which include everything you need to build your own sauna. We also understand the need for easy to assemble prefabricated saunas which we have been manufacturing since 1963, right here in Southern California. We feel with so many options available on the Internet today that people can get lost and fall for fancy marketing. We like to take the time to understand each customers needs so we can custom tailor a sauna experience that each individual will enjoy. This is truly what sets us a part from any other company! OUR PRODUCT We start the process by drying and milling our lumber at our California high desert facility. This approach ensures that we control the product quality from start to finish. Our lumber is dried to an amazingly low 10% humidity. This lumber curing method is more natural and reduces stress, cell collapse and lumber shrinkage. 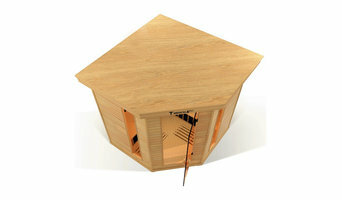 Many wooden sauna accessories are made in California on our state-of-the-art equipment. We understand your needs to build your own pre-cut or assemble pre-fabricated saunas which we have been manufacturing since 1963. We import our sauna heaters, steam generators and accessories factory direct from Finland and Sweden, home of the Original saunas. *Authorized Bullfrog Spa Dealer* California Cooperage of Santa Monica is the oldest spa and hot tub dealer in Los Angeles, in operation since the mid-1980s. We have been at our current location on Main Street in Santa Monica, CA for over 30 years. We are well aware that it is our job to help you find your perfect hot tub. That’s why we are the only hot tub store in Los Angeles to offer hot tubs that can be personalized specifically for each customer, considering your physical needs and price-range. In our long history of marketing hydrotherapy systems, California Cooperage has been proud to introduce Coleman, Amerigo, and Jacuzzi brands to the Los Angeles market in the past. And today we are excited to introduce Roberts Wood Tubs and Bullfrog Spas to the Los Angeles market. Bullfog Spas are the absolute best hot tubs being built today. Bullfrog Spas feature the most modern spa designs aesthetically, but additionally, their patented JetPak Therapy System™ provides for a more economical, powerful, and soothing hot tub experience. Our customer service has always been our trademark. Come visit us today at California Cooperage of Santa Monica. We do not employ commissioned sales representatives, so we offer low pricing and no high-pressured sales. We have free parking in the lot adjoining the building. We look forward to introducing you to our new 2017 inventory of hot tubs. *Authorized Dealer of Bullfrog Spas, Hot Spring Spas, Sundance Spas, Freeflow Spas and Endless Pools. California Home Spas & Patio is a family owned business that has been providing high-quality outdoor products to Southern California since 1979. With over 30 years of experience; our friendly and knowledgeable staff is available seven days a week to provide you with the highest level of service available in the outdoor industry. We look forward to helping you find the right outdoor accessories to fit your outdoor living needs; whether it is a hot tub, patio furniture, BBQ grill, or any other product that interests you. We sell Tropitone Furniture along with O. W Lee, Brown Jordan and Jensen Leisure. You can also come by our spa & patio furniture store in Long Beach, south of the 405 close to the Cherry exit. Our sales professionals will offer you a no-pressure opportunity to learn about our products first-hand and witness a demonstration. When it comes to outdoor furniture and spas, we are your first and only source! When you buy from us, you get a fair deal, with no fine print. And you’ll be telling everyone about our elite product line. *Authorized Bullfrog Spa Dealer* With over 40 years experience, we’re pleased to say “Made in America” and we’ve worked hard to earn the stellar business reputation to go along with it. Our loyal and dedicated customers have kept us busy over the years and we look forward to continuing to over deliver and exceed expectations with quality products and exceptional customer service. When it comes to improving quality of life, we enjoy making good on our promise to make life just a little bit better. An accredited member of the Better Business Bureau with a “A+” rating, we strive to give each and every customer a stress free, enjoyable experience when they invest in a spa. It is our pleasure to offer a no cost obligation free home site inspection to help you choose the perfect spa to fit your budget and your lifestyle. The MAAX line of spas includes Elite Spas, VITA Spas, and the PowerPool Swim Spas. Each and every one offers a variety of sizes, innovative features and more making it super easy to find exactly what you need. 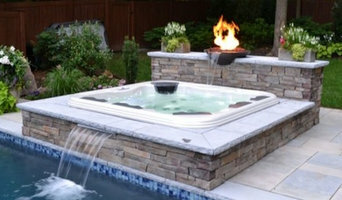 California Home Spas & Patio provides brand name hot tubs and patio furniture for all of Southern California. We've been a family-owned and operated business since 1979 and guarantee the lowest price or price-match of all our merchandise. Call or visit our showroom today and see why California Home Spas & Patio is the best in Southern California when it comes to Spas or Outdoor Furniture. We serve all of Southern California from Los Angeles, Orange County, Riverside, and San Diego. Janice Hair Design is one of Santa Barbara's best hairstylist! Janice provides all your hairdresser needs including hair color, hair cuts, ombre, root touch-ups, updos, weddings, special events and more. Janice works out of Salon U, a premier hair salon located in the heart of Santa Barbara. Make an appointment with Janice today! Take a moment to devote some time to yourself at our Urban Beauty Sanctuary in the heart of Downtown Los Angeles. We love to give you our time to care deeply about your mind, body, and soul, to create a relaxing moment in the middle of the busy city life. We welcome you to discover our unforgettable experience of high-level Beauty Care at our Hair Salon, Body Spa, and our Revolutionary Japanese Head Spa. It’s important that you do some research before visiting a local Thousand Oaks spa and hot tub dealer. While they can give you lots of information about features and financing, you should have an idea of where you would like to position your spa and what its main function will be. Do you plan to use it mostly for relaxation or socialization? How many people will be using it? All of these things will help the hot tub dealer pick the best models for you. Decide who will be responsible for daily maintenance in your household and if the extra energy costs are something you’re actually willing to incur. Also, know that most hot tub stores in Thousand Oaks, CA let you do test soaks, also known as a “wet test”, where you can throw on your suit and take each model for a spin in the showroom so you know exactly how they feel before purchasing. Don’t be shy — just think of it as test driving a car! Find spa and hot tub dealers in Thousand Oaks, CA on Houzz. Narrow your search in the Professionals section of the website to hot tub and spa dealers in Thousand Oaks, CA. You may also look through photos to find hot tub designs you like, and ask about the details of the spa, including the manufacturer and where it was was purchased.